Applications are now being accepted for the position of Editor of Teaching Classical Languages (tcl.camws.org). The term of the current Editor ends on June 30, 2019. 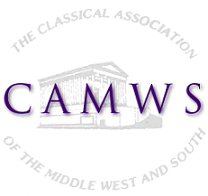 Applicants must be members of The Classical Association of the Middle West and South (CAMWS) and must agree to serve at least one five-year term (July 1, 2019 through June 30, 2024). The CAMWS Constitution permits the term of the TCL Editor to be renewed once. The TCL Editor is responsible for building an editorial team, for soliciting articles, for corresponding with authors and referees, for preparing and submitting electronic copy, for marketing the journal, and for supervising all initiatives undertaken by the journal, including its website (tcl.camws.org). The TCL Editor appoints an Editorial Board, who serve four-year terms. The TCL Editor sits on the CAMWS Executive Committee and is paid an annual stipend. The CAMWS Secretary-Treasurer serves as Business Manager of Teaching Classical Languages and handles financial matters. A more detailed job description can be found here. It is expected that the host institution, if necessary, will provide office space, computer facilities, and complete or partial funding for an editorial assistant. The first issue produced by the new Editor will be TCL 11.1 (Fall 2019). A letter of application with a CV should be sent by email to Professor Antony Augoustakis, Chair, TCL Search Committee (aaugoust@illinois.edu). The letter should address one's vision for TCL for the future given the journal’s increasing readership and include a statement about possible institutional support for the journal. Informal inquiries in advance of an application are welcome. Consideration of applications will begin on November 12, 2018 and will continue until the position is filled.